So I had hoped to have a grand ribbon cutting for the big reveal of the table....complete with chairs around the table filled with happy guests, new (old) furniture in the room, our bookcases painted, art and photographs neatly hung on the wall......but come to find out, all that takes more than a few weeks! I'll keep you posted as we add to the room.....so for now, here's brand new (but old looking!) table. We started out with a good solid base--our OLD TABLE, bought 4 years ago at the Global Baazar Target clearance ($50!). We are so green for using our old table. So green? Or so cheap....you decide. We then got our wood (see here)....just from Home Depot, nothing fancy. I looked for the planks with the most knots and best grain. Let the sanding games begin. 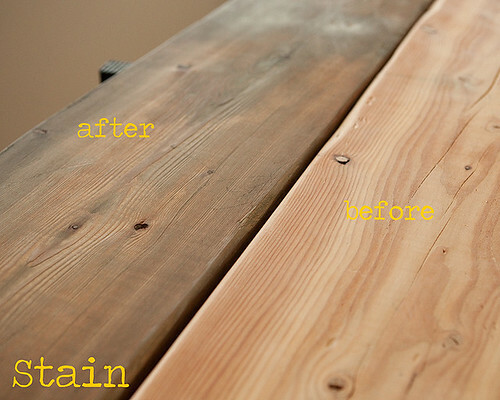 We (he) sanded off all of the black finish from our Target Wood table. Target wood= I have no idea what kind of wood it actually was, and believe it to be a combination of many woods fused together to create a super breed. Super weird. It was then my turn to distress the planks. I LOVED this part. It was like art.... a little here, a little there. Dents, scratches and scuffs. And then sanding each down for a smooth and worn look. I beat, I mean BEAT down on the ends with the hammer and the chisel, and then sanded against the grain to make it look extra worn. I also chiseled away at the legs of the table, so they weren't so perfectly square. The stain. The most interesting part. I wasn't loving any of the stain colors I was finding. 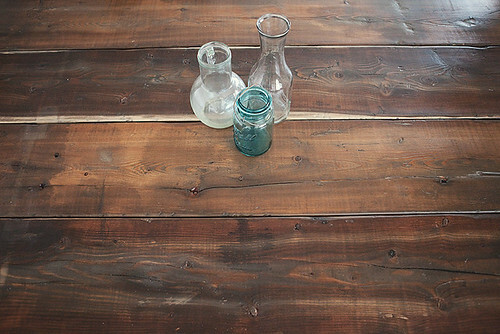 I did a little research on how to re-create weathered wood. The answer: soaking steel wool in vinegar. I found that 24-36 hours of soaking gave me the color I liked. Soak it for a few days and the steel wool rusts, giving you a redder color. I loved the grey tones it gave to the lighter parts of the wood. And it was DIRT CHEAP. We're talking dollars to stain the entire table (one coat) The legs took 5 coats to finally get some color...that Target wood is weird stuff. There are splotches that would take NO stain at all, but I think it adds to the look we were going for. I just used a rag to apply the stain, and let a stain soaked rag sit on a few spots for an hour or two, to add some splotches to the wood. there you have it. All for under $75. For now, we have no chairs....one step at a time. freaking stellar. like i looooove it. 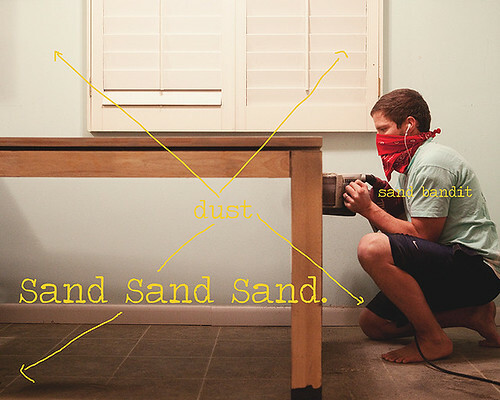 and if i weren't so gosh darn pregnant i'd be dragging my dining table out to the yard to do a little sanding myself. 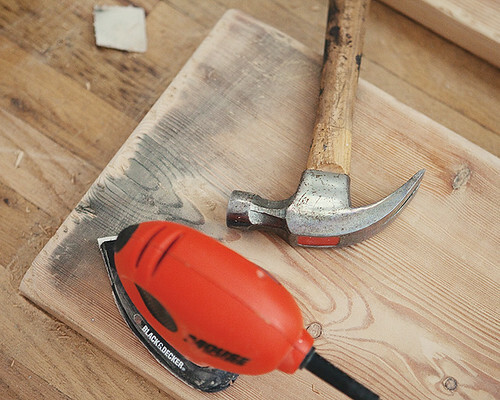 i pose this question: why does my particular case of nesting come in the form of wanting to repaint/restain/reconfigure every inch of my house?!?! it is absolute torture. so i'm glad i get to live vicariously through you. go sheena! So can you guys come over and redo my table. That is too awesome. I hope you keep the mismatch chairs... i love that look. Soooo incredible! I love it to death. I'm so impressed. ohh and I bet if you add a super stellar chic carpet it would go well... I love decor..again fantastic job. Beautiful job! This looks amazing! Can I just have YOU make mine? It's so pretty! We've had so much snow and ice that I've lost all motivation to build! I'm too dang freezing! Thanks for all of the advice. Your post makes me want to get movin' again. Yay for inspiration!!! wow -- well done. I love the finish; and the space. A lot of work paid off. how slick is that? i'll definitely be showing this to my husband later. it looks marvelous! and i love the jars you set on top.. so pretty. You are brilliant. It looks amazing!! Thanks for commenting on my blog because it led me to yours and I love it. The table looks great, but I LOVE your chairs! I would totally take time to find the perfect ones to complement that lovliness! This is my first time here, BTW, but I am definitely bookmarking you. Ohmygosh, I LOVE LOVE LOVE this! I think I'll do the same to my table when it needs replacing. I love the big reveal. Now please recreate this for my birthday present. How much vinegar did you use per steel wool and how much would you say you needed per plank of wood? Did you do multiple coats? I love this--I'd like to make a frame look aged and appreciate any extra details about the 'staining' stage that you'll share! I had to make a much stronger solution for the legs--2 pieces of steel wool and just enough vinegar to cover them. Wow! That table. is. rad. Thank you SO MUCH for this tutorial! I've been looking for aged looking wood to no avail. And I <3 DIY. Can you please tell me what type of wood you used for the top? I ask especially because I found other sites saying to use the steel wool vinegar method to GRAY wood and I'm curious whether it's the TYPE of wood or strength of the staining SOLUTION that makes the color more gray or reddish. Thanks in advance! the wood for my table.....it was just whatever home depot sells.....I'm assuming pine?? I am seriously a wood dummy! I tested out the stain on the ends of the boards (we cut them a bit shorter) to try out different strengths and see what I liked best. The longer you soak the steel wool, the redder the stain will be (because it will rust). And our table was actually very grey....until we put the sealant on it......but we had to seal it. Still happy with the color though. Wow, this is just what I was looking for. I'm refinishing a table and didn't like the look stain was giving me. The vinegar soaked steel wool was just the trick. Thanks so much! Wow this is awesome! 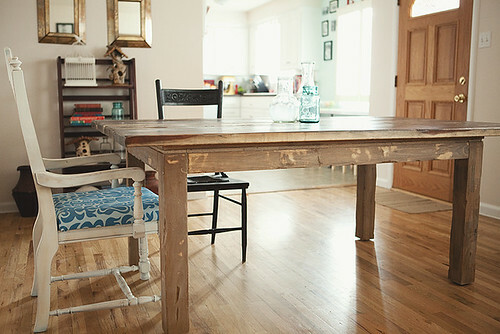 If I didnt already have a farmhouse table I would totally use your tut and bust one out! Good luck on the chairs! I loved this so so much. Check out our version. Thank you for the insipration! Target wood is weird! I've tried sanding it down to bare wood and beyond and it still wouldn't take a stain. im glad it wasn't just me! Thanks for posting. I have been seriously considering the vinegar/steel soak (or "Liquid Nightmare" on other sites) on wood floors so the tip on the sealant changing the colors was helpful! I LOVE this look and have been totally inspire to do this project, My questions is what kind of Poly did you guys use?! What an inspiration! Was looking to buy a farm table? What was I thinking! Beautiful table! I'm wondering though, what stain did you use? How many coats? 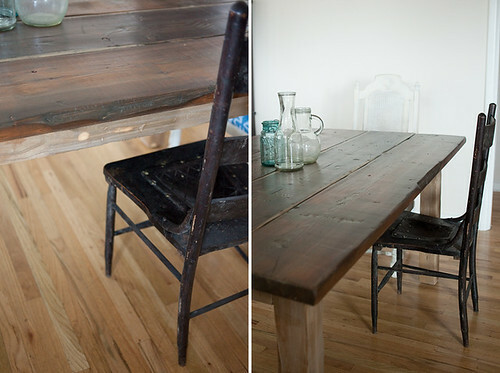 I am preparing to build an over sized Farm Table for my wife and have been considering how I will stain it -- I think you have hit on it here -- Thanks for posting the recipe! Looks amazing! Do you remember what size lumber this was? Was it 2" thick framing wood? Or did you go for a 5/4" or 1"? I'm looking to have restored and fixed. Terrific table! Way to go. such a great post. Thank you! This is exactly what im about to attempt! I love it! I am just cofused about the how much steel wool to vinagar you need to use?? Does it matter??? Thank you, LOVE your blog! I'm wondering about the ratio of steel wool to vinegar? The table looks gorgeous! I'm actually going to try out the stain on a table I found. Can you please tell me what steel wool you used and what type of vinegar? I got the steel wool from Home Depot, grade #00 and have soaked it in white vinegar. It's been soaking for 24 hrs now and so far the vinegar is still transparent. Thanks a lot! @emma wagner the ratio doesn't really matter. @tanushree malhotra I have no idea what grade my steel wool was (honestly I didn't know there were different types:) It was just a large piece in a large bowl of vinegar. It won't actually turn a dark color. It may start to get a rusty colored ring around the edge after a few days, but that's it. Test it out on a piece and see if it's a color you like. Thanks for your response Sheena. Does it matter what kind of vinegar? I'm using white vinegar. Thanks! What kind of poly did you use? Clear satin or a gloss? Did you put it on with a brush or a cloth? 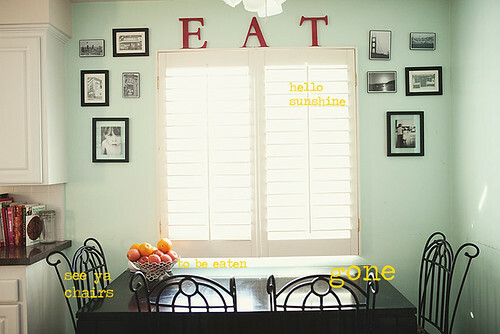 Really am appreciate with your article ,farm tables are using in different ways and nice pictures are there. Owner of farm table company. Absolutely gorgeous! Great job! I recently got a great free table base from Craig's list, it has no top, so I am planning to build one.